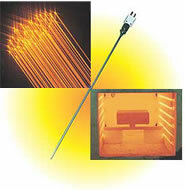 Yamari Tungsten Rhenium Thermocouple for High Temp. 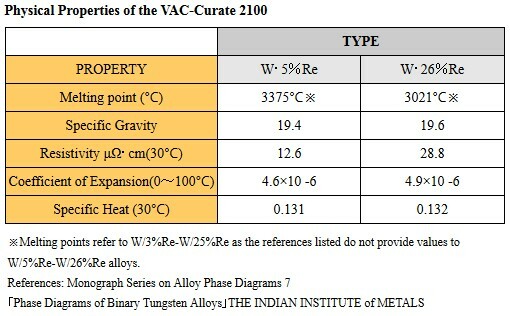 The demand for measuring very high temperature in research laboratories, specialized furnaces, and in other high temperature experimental and industrial applications has grown dramatically in recent years. In response to this demand, Yamari Industries has been providing its Tungsten Rhenium thermocouples and expert knowledge to customers needing accurate measurements of high temperatures in a wide range of fields. 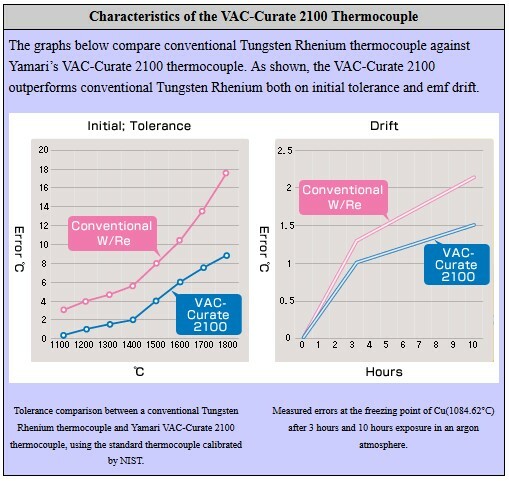 Now, Yamari is pleased to announce it has developed a new type of Tungsten Rhenium thermocouple, “VAC-Curate 2100”, in conjunction with a world class Japanese manufacturer of quality alloys and can supply thermocouple elements conforming to ASTM standard E988-96 in matched pairs.